(CNN) -- Championship leader Jorge Lorenzo underlined his early season form by recording the fastest time in Friday's practice for the Italian MotoGP at Mugello. Lorenzo powered to a superb lap at Mugello on his Yamaha. 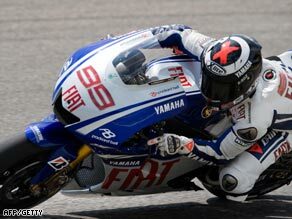 The Fiat Yamaha rider, who leads the standings from teammate and home hero Valentino Rossi, recorded a best of one minute 49.870 seconds. Reigning world champion Rossi, who has won at Mugello for the past seven seasons, was two-tenths of a second slower. Casey Stoner on his Ducati and Dani Pedrosa on the Repsol Honda, who are third and fourth in the championship race, were next fastest as the title challengers made an immediate impression on the quick circuit. Pedrosa recorded the fastest speed of 349.4 kph ever recorded at a MotoGP during his lap of one minute 50.808 seconds. Rossi and Pramac Ducati riders Mika Kallio and Niccolo Canepa also beat the previous Mugello top speed of 343 kph set by Alex Barros. Colin Edwards was fifth fastest with Alex de Angelis in sixth. Loris Capirossi was seventh quickest at his home race for Rizla Suzuki and Randy de Puniet was the eighth best. Saturday's qualifying will decide the grid positions for Sunday's race.